A second contribution to a widening wealth gap, post-recession, has been housing. A home is often the most valuable asset people own, so the steep drop in house prices and the spike in foreclosures were big setbacks for people who aspired to build wealth through homeownership. According to a recent Federal Reserve study, millions of first-time homebuyers, particularly blacks and Latinos, who took out fraudulent subprime mortgages lost not only their homes in foreclosure but the savings they used for down payments. Contrast that to high-income and wealthy people who could afford to hold on to their properties as values plunged and then rebounded in the strong housing market, especially in the cities. Inequality is also feeding on itself through an important avenue that low- and middle-income families have always used to improve their children’s prospects – by sending them to college. A 50 percent increase in college costs in 15 years, combined with the necessity to borrow large sums to pay for it, will close off opportunity for more and more lower-income families, Moody’s said. This outcome would reinforce the existing mismatch between less-educated workers and the good jobs available in a modern economy requiring a college education – a mismatch at the heart of today’s inequality. The economic expansion continues, yet six in 10 people surveyed in a recent Harris-Harvard Poll said their personal financial situation is no better or worse than it was a year ago. Widening U.S. inequality may partly explain why. The problem is the top 1% complains about tax rate of 50%, especially TV people. However they never bring up the data that the top 1 % collects over 23% of all earnings in the U.S.
– Wealth and prosperity are not zero-sum games. Just because you make a million dollars doesn’t mean that I can’t. Just because someone else is rich doesn’t mean that you and I can’t be. There isn’t a finite amount of wealth or income out there. Anyone can get theirs. The pie simply grows larger for however many do. – As for the inequality gap, just as with most things, the primary driver is personal choice. We discuss this regularly. Education, training, and skills in marketable, in-demand career fields is the key. – We know the “success sequence” of how to get there. It’s almost always about making the right personal choices. As for the significant increase in college costs, that is also caused by a combination of poor personal choices, government involvement, and universities well awareness of market forces. Once universities – who have no real skin in the game – discovered that young people and their parents would pay any price to go to “that” expensive institution just for the college experience, and the gov’t would aggressively loan the money to saddle them with debt, they acted exactly as expected – increased costs to as much as the market would bear. Another problem the article passes over is that people (not just millennials) are choosing the wrong career fields. As mentioned earlier: we know which occupations pay good wages; and we know what skillsets and qualifications provide access to those occupations. Good outcomes most often come from making good personal choices. No one with a bully pulpit – not elected officials, not community leaders, not the media – are calling for people to act responsibly. All have a vested interest in the status quo. With all due respect, not everyone has grown up in a privileged household with the means to even make “good personal choices” or attend higher education, regardless of cost. Additionally, not everyone has the IQ to aspire to a college education or higher paying jobs. I think that we who have spent our lives in privilege, in higher education, and good-paying jobs with other just like us, need to understand that not everyone’s world looks like ours. For many, the things that we have achieved are not even within the realm of possibility. To turn around and blame those who are less affluent for making poor personal choices is simply designed to allow us to feel comfortable in our affluence. It is time for us to get off our high horses and spend time with those of us who are less fortunate. Until we understand their world and the obstacles in place that prevent them from succeeding, we will be unable to right economic inequity. Besides which, if everyone were able to achieve affluence, who the heck would make your meals, mow your lawn and clean your house?? It seems like the affluent are those who have the largest vested interest in the status quo! This headline is extremely (intentionally?) misleading. It implies that income inequality somehow begets further inequality or is self perpetuating. The article provides no support of that premise. 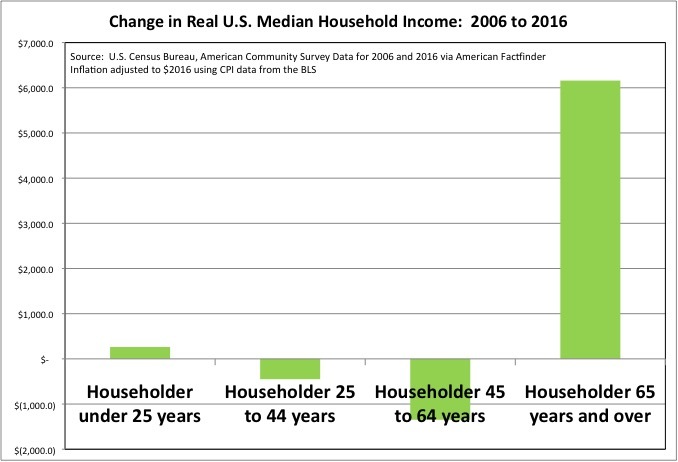 In fact, no cause of the alleged inequality is even discussed as if to conclude that the mere existence of different income levels is evidence of it accelerating. when there’s more inequality, consumers have less to spend, which slows the economy. When the economy goes into a recession – which is eventually does – inequality gets even worse.